There is a pretty wide selection of buskers around Melbourne. From electrified bands to jugglers to statues. I often stop, have a listen and occasionally buy one of their CDs. While walking through some of the laneways along Little Collins Street this week, I found this Cello busker in Block Place. 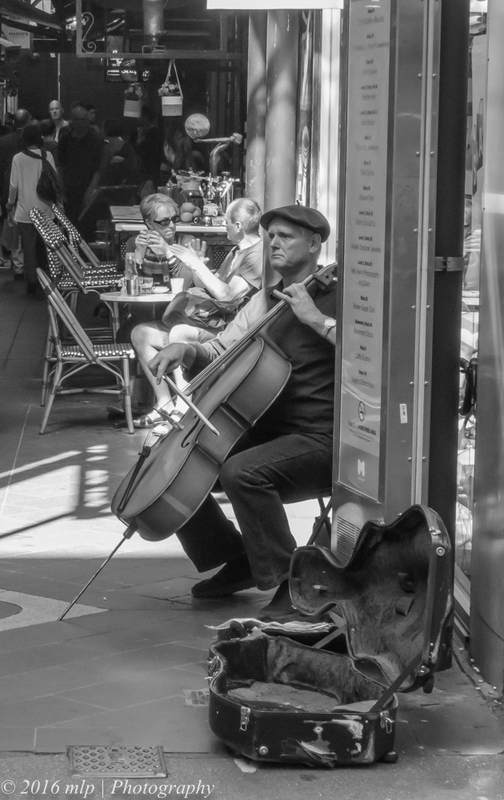 This entry was posted in Black & White, Busker, Melbourne CBD and tagged Australia, Block Place, Buskers, Cello, Melbourne CBD, Melbourne Laneways, Photography, Street Photography, Urban Photography, Victoria. Bookmark the permalink.